As the largest multi-specialty physician practice in downtown Washington, DC, The GW Medical Faculty Associates offers a comprehensive Total Rewards package, including competitive salaries, a generous benefits package, partial tuition reimbursement for courses at George Washington University, and a workplace that promotes growth, development and creativity. We offer convenient hours of 8am - 5pm. No evening or weekend hours required. Department leaders will be available to hold on-site interviews for all qualified candidates. Please come prepared with your resume. Oversees quality services for a team of contact center representatives within the Department of Medicine Contact Center. Acts as subject matter expert for their team and performs quality monitoring on a monthly basis. Handles training for onboarding team members. Minimum of two years’ experience in a medical office, healthcare setting, or call/contact center environment is desired. 3-4 years’ overall work experience required; some portion in a medical/healthcare environment is preferred. Experience utilizing a web-based computerized system for scheduling is desired. Proficiency in Microsoft Office programs, Word and Excel, is required. Experience with Microsoft OneNote is desired. 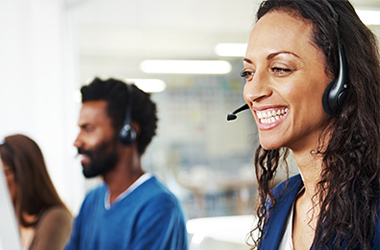 Experience with contact center and/or workforce management software is desired. Experience with ACD and/or VRU telephony systems is desired. Typing speed at a minimum of 45 WPM is required. Bachelor’s degree or some college preferred. Knowledge of medical terminology or completion of medical terminology coursework desired. You can find information and descriptions for the Contact Center Specialist and Referral Specialist positions below.